Mirador Retirement Community - Stained Glass Inc. The Mirador Retirement Community, a very unique retirement and assisted living facility in Corpus Christi, TX, provides a luxurious lifestyle for their residents that feels like an endless vacation. From the facility's community events and meals to their staff and decor, every aspect can be compared to a beautiful coastal resort. Every building and room is stylishly designed and decorated; the entire facility exudes class and a comfortable elegance. 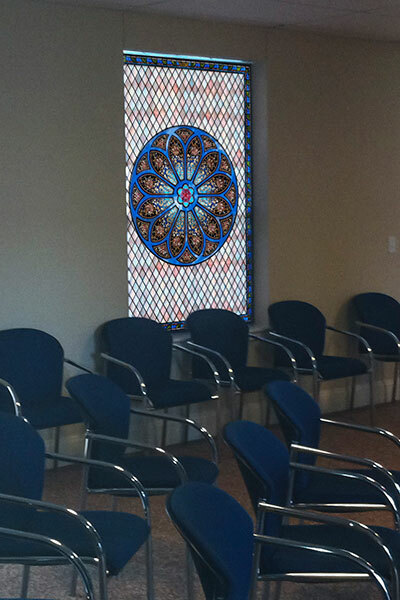 When looking for stained glass to display in one of their community rooms, Mirador contacted Stained Glass Inc. They found a rose window design they liked on our website and one of our talented artisans worked to design a beautiful background and border that perfectly fit with the original piece. After the complete design was drawn out, a full color proof was sent to Mirador and once the design was approved it was sent to production. The panel was delivered to Corpus Christi in a few short weeks and the piece fit perfectly using the dimensions provided by the client.